Vancouver Christmas Market delivers festive cheer! 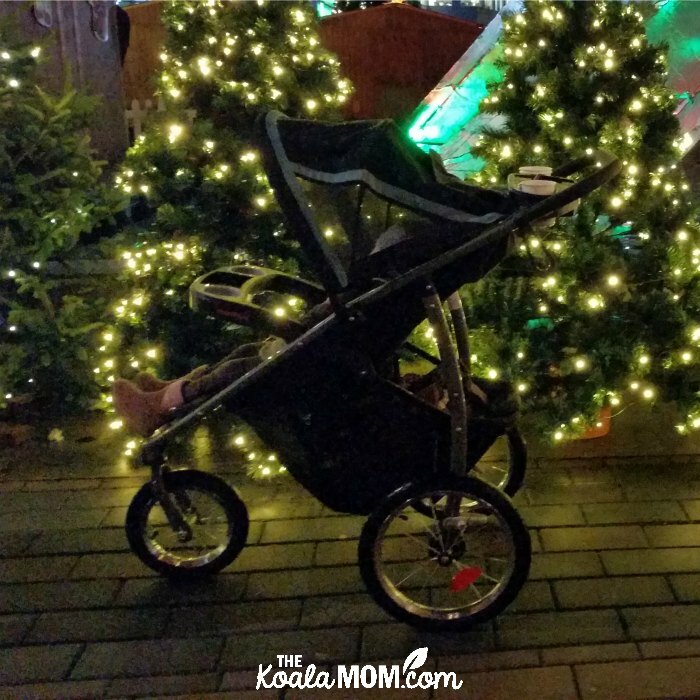 Holiday events are in full swing around Vancouver! The Vancouver Christmas Market is one of my favourites. Located downtown, this traditional German market offers plenty for the kids to do, yummy food and drink, and some shopping opportunities for parents. This year, the girls and I caught the SkyTrain to the Market, rather than trying to deal with traffic and parking downtown. The Vancouver Christmas Market is about a four-block walk from the Burrard Street Skytrain Station. We enjoyed the lights of downtown before arriving at the Market. Our first stop was at Das Pretzel Haus to grab some snacks. Sunshine had a cheese pretzel while the rest of us got chocolate pretzels. I saved a regular pretzel for Pearl when she woke up. The girls were super impressed at how big their pretzels were! It was a yummy treat to munch while wandering around the Market—or waiting in line for the Carousel. The girls love Carousels. We were there early enough to avoid lineups; they walked right on and picked their favourite horses. Pearl was napping, so I let the older three girls have a couple rides while I waved and took pictures. When we went back later, Pearl was excited about getting on the Carousel. After a couple times around, however, she said, “Off!” Thankfully, we’d picked a horse with a bench right behind us, so I quickly moved us to the bench for the rest of the ride. She didn’t want to ride again, and was happy to watch her sisters go around one more time. After the Carousel, we discovered the Kinderhuts. There are six located throughout the market, with a different kids’ craft or activity at each, courtesy of 4Cats Arts Studio. The girls received a colouring book at the first Kinderhut. It had a map in the back, helping us find each of the other Kinderhuts. At each house, the girls got a stamp on their map and when we’d visited all six, they’d earned a free ride on the Carousel. Needless to say, we were on a mission! While the girls were doing crafts at the Kinderhuts, I listened to the live music and browsed the vendors next to the Kinderhuts. Sunshine had fun chatting with the gentleman at the Honeybee Centre and sampling honey. He was quite impressed with her knowledge of buckwheat honey (Daddy’s favourite!). We also stopped for photos in Santa’s Sleigh and in the giant Christmas tree. The girls loved all the lights and decorations around the Christmas Market. For me, all the German phrases and signs brought back memories of my university German classes. Frohe fest! 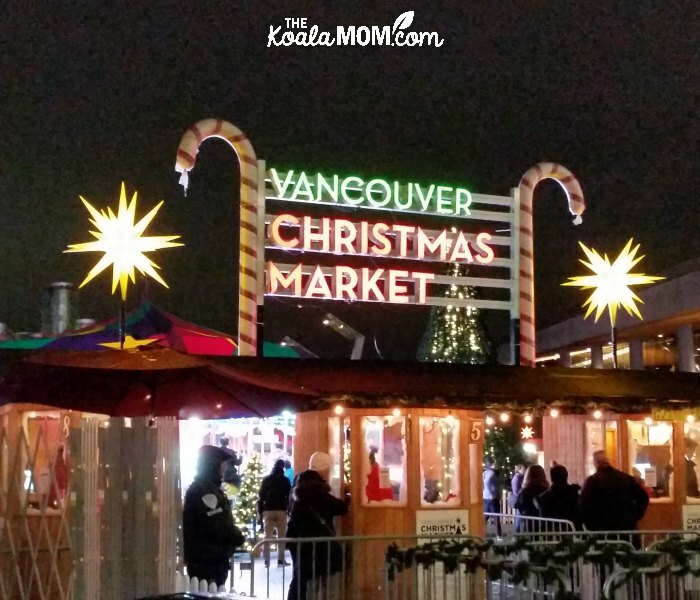 To plan your visit to the Vancouver Christmas Market, drop by their website. You can also follow them on Facebook and Instagram. Baby-friendly: I’d recommend wearing baby in a carrier rather than bringing a stroller if you can. It’s easier to keep baby warm in a carrier than stroller. Change tables were also located outside the market, down a long ramp or stairs, in the washrooms underneath the plaza (not super convenient if baby needs multiple diaper changes). Otherwise the Market was wheel-accessible, with ramps throughout instead of stairs. Kid-friendly: Yes! There was plenty to do at the market for the older three girls, as well as lots of kid-friendly snacks and drinks if they got hungry. However, if your kids don’t like porta potties, be aware of the distance to the indoor washrooms and go ahead of time! Fees: Kids under 6 get in free. A family admission is about $30, plus tickets for the Carousel (if you kids want to ride). There is an early bird discount available at the Market gates if you arrive before 4 pm on Mondays through Fridays. Dress for the weather! It drizzled on and off while we were there, so waterproof coats were needed (and maybe umbrellas). It can also be colder after dark and down by the harbour. I had the girls put on winter hats and mitts, but forgot to throw in a blanket for Pearl in the stroller, so she ended up getting cold during her nap. Bring your own sippy cups or coffee mugs for the Gluhwein and Kinderjuice, as the cups provided there didn’t have lids (making it hard to wander the market without spilling). Bring a camera! There were several photo ops, from a traditional sleigh to a giant Christmas tree you can stand in. If you’re going after dark and taking pictures, you’ll want a good camera (instead of your phone—you can see that my pictures are a bit grainy). If you have little children, go earlier in the day to avoid the crowds and get the early bird admission. 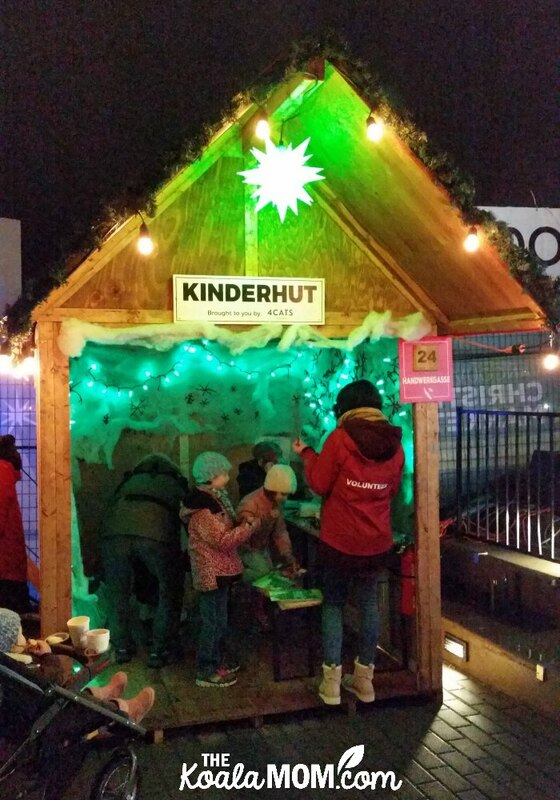 Portapotties are located right inside the entrance to the Vancouver Christmas Market, near the Carousel and one of the Kinderhuts. Indoor washrooms are located out a gate and down the stairs (or very long ramp if you have wheels). Looking for more holiday activities around Vancouver? Check out my list of family-friendly events! 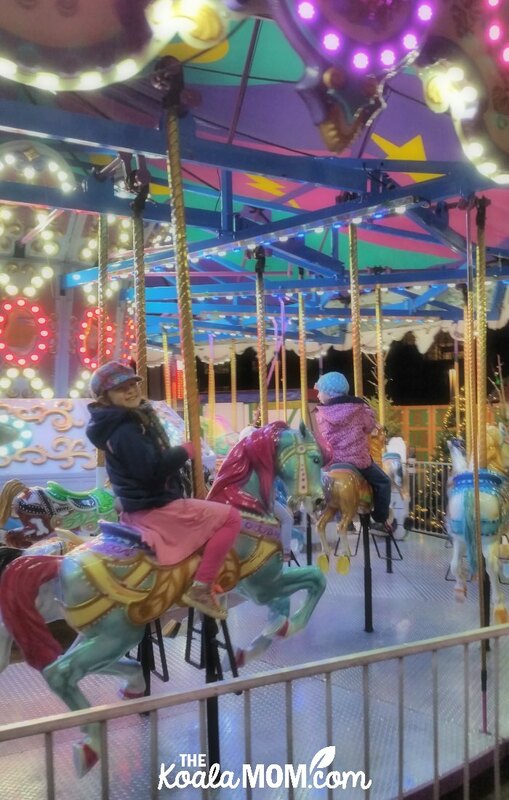 I received complimentary admission, pretzels and carousel rides courtesy of the Vancouver Christmas Market; all opinions expressed are my own.